It’s been some time since I recommended a book to readers, so I figured it was time. I recently read Schifflebein’s Folly by Iris Chacon and absolutely loved it. It’s a feel-good, do-good, read-it-all-in-one-sitting-if-you-can-good, does-your-heart-good book. It’s the story of Lloyd Schifflebein, a Floridian with a passion for children, work, and doing good. He is endearing almost to the point of being too good to be true, and you can’t help but love him. He’s spent his life getting ready for the day when he would adopt six children, and though he doesn’t have a life partner, he knows that the future Mrs. Schifflebein will show up when the time is right. Those six kids? They all have special needs and it seems Lloyd is just the man to meet those special needs. He’s got good friends, a healthy respect for the adoption process and its timelines, and he’s handy with tools. All these things come together to help him when he needs it most–when everything he’s worked for looks like it’s in danger of collapse at the hands of crooked politicians. And it doesn’t hurt that he has somehow ended up with a talking, often snarky, sometimes bossy, teapot. You read that right–a teapot. Lloyd recalls a similar teapot from his tumultuous childhood, and this one shows up at his house just when he needs it most. Now, I don’t usually read or enjoy books with any hint of the supernatural, but the talking teapot was just perfect in this book. I loved that teapot and I think I could use one in my own house sometimes. There’s a lot of fun to be had in this family-friendly book, and when the going gets tough for Lloyd, you somehow know everything is going to work out just the way it should. To me, timing was the theme of the story–one can’t make things happen if they’re not ready to happen. I hope you’ll take a look at Iris Chacon’s book. I think you’ll love it. You can find it by clicking this link (at the time of this writing, it’s only 99¢) and you can connect with Iris here. This entry was posted in Book Recommendations and tagged Delia Stewart, Duby's Doctor, faith, family stories, feel-good stories, Finding Miranda, Florida writers, Iris Chacon. I’m amazed and honored by Amy Reade’s fantastic recommendation of Schifflebein’s Folly. God bless you, Amy, and many, many thanks. 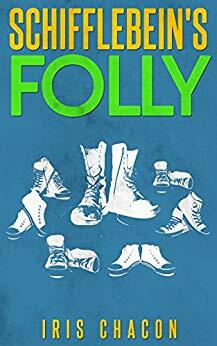 Schifflebein’s Folly was recently released on audiobook for readers who prefer listening. Thanks for the reblog, Iris! Oh goodness, Amy Reade! I’m gushing happy tears at your incredible review of Schifflebein’s Folly! I am amazed and honored that you took time out from writing your wonderful mysteries to read and review this little book. I’m glad it made you feel good. You have made me feel ecstatic! Thank you! I think everyone should read it and love it! Thanks so much for the reblog, Lelia! What a great review, Amy. If I didn’t have way too many books piled on my desk that I must read, I would grab this one. I may anyway. I’ve been looking for another bookcase to house all the books I have to read, but I haven’t had any luck finding one with the dimensions I need. I loved Schifflebein’s Folly, as you could tell from the review. Iris Chacon has a great knack for writing feel-good stories. The next one I plan to read by her is Duby’s Doctor.